The University of Oklahoma Health Sciences Center (OUHSC) is a comprehensive academic health center whose mission is to educate students, residents, and other trainees in professional and graduate and programs to become Oklahoma's future team of healthcare leaders, clinicians, researchers, and educators; to advance distinctive basic, translational, clinical, and population research; to innovate and commercialize discoveries; and to deliver exceptional patient care across the full breadth of adult, women's, and children's specialties. The Graduate College of the University of Oklahoma Health Sciences Center (OUHSC) is the educational center for the training of world-class biomedical researchers. The OUHSC Graduate College is committed to training the next generation of biomedical researchers who will identify the basis of human diseases and develop the means to translate these findings into clinical applications to treat disease. The mission of the College of Allied Health is to empower life by maximizing human potential through allied health interprofessional, education, research, care, and community engagement. The mission of The University of Oklahoma College of Dentistry is to improve the health of Oklahomans and shape the future of dentistry by developing highly qualified dental practitioners and scientists through excellence in education, patient care, research, community service, faculty and facilities. Our mission is leading health care - in education, research and patient care. Our goals are Uncompromising Quality, Exceptional Service, Innovative Education, Advancing Knowledge, and Institutional Strength. This mission is tied to our core values. The University of Oklahoma School of Community Medicine (OUSCM) mission focuses on improving the health and health care of the entire community. 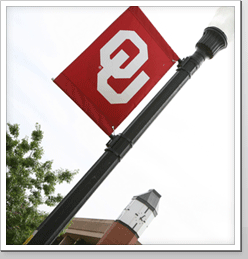 The University of Oklahoma College of Nursing strives to be the leader in nursing education, research, and practice innovations to promote excellence in education, research, and practice. This mission is tied to our core values and goals. The mission of the University of Oklahoma College of Pharmacy as part of a comprehensive academic health sciences center is to educate and empower professional, graduate, and post-graduate students to be highly qualified pharmacy practitioners, scientists and educators. The mission of the College of Public Health is to protect and improve the health of the people of Oklahoma, the United States, and other nations through: (1) education, public health workforce development, and cutting-edge research; (2) translation of research and scholarship into public health practice and service; and (3) the development and advocacy of evidence-based health management and policy.